Cradled against the southern tip of the Blue Ridge Mountains in North Georgia is Pickens County. The county was formed in 1853 and named after Andrew Pickens. Prior to that the land was owned and occupied by the Cherokee People until their removal in 1838 due to a gold rush that began in the early 1830's. The Cherokee lands were a part of an 1832 lottery conducted by the state of Georgia; their lands were given to white settlers whose real pursuit was driven by gold fever. Although gold was the original intent for most white settlers in the region, it wouldn't become Pickens County's future claim to fame. It seems that a grade of exceptionally pure marble laid in abundance in Pickens County, a deposit of marble that ran five to seven miles long, a half-mile wide and 2,000 feet deep. The Native Americans in this area including the Cherokee People who arrived in the region during the early 1500's had used and traded marble as early as 800 A.D.
Henry Fitzsimmons who was also credited for creating the first marble mill dating back to the 1830's established the Georgia Marble Company in Pickens County, in 1884. With the coming of the railroad in 1883 Georgia marble became available and was highly sought after by the outside market. The hot bed for this valuable marble business was located on the Tate properties, leased by the Georgia Marble Company. Colonel Sam Tate became President and General Manager of the company in 1905. This pure grade of marble was transported across the country by railroad and used in several notable buildings. Some of these structures included the Lincoln Memorial, House Office Building, the East wing of the National Gallery of Art, the Bok Sing Tower in Florida, the Buckingham Fountain in Chicago, New York's Stock Exchange Annex and the Cleveland Federal Reserve Bank. Visitors to Pickens County can witness an example of this fine marble in the form of a marble-mansion adjacent to the marble company's headquarters in the local community of Tate. Colonel Sam Tate built the beautiful and privately owned home in 1926. Constructed of pink marble, the structure stands as a testimony to the county's famed marble industry. Much of Pickens County rests in the southern reaches of the Blue Ridge Mountains and flows into what's referred to as the Great Valley in North Georgia. The mountainous country of Pickens county is in North Georgia's Chattahoochee National Forest with some private mountain lands available for residential living. The heart of the Pickens County lies within its quaint communities; Jasper, Talking Rock, Tate, Blaine, Marble Hill and Nelson make up the local towns. Jasper, the county seat is the largest town in Pickens County, named after Sergeant William Jasper, a Revolutionary War solider of fame. During the Civil War the county had many northern sympathizers who continued to fly the Union flag over the county courthouse for a period after Georgia seceded from the Union. Old Federal Road runs from Tate through Jasper to Talking Rock, this highway coincides closely with the course of the Old Federal Road, northwest Georgia's first vehicular way which linked Tennessee and Georgia across the Cherokee Country. Permission to open the route was granted informally by the Indians in 1803 and confirmed in a treaty in 1805. Emigrants from the lower southeast followed this course into Tennessee and Alabama. It became the first postal route of this section and was used by travelers in reaching the gold fields of North Georgia. The town saw modest prosperity until the arrival of the railroad in the 1880's. Jasper has a fine example of old architecture making the downtown's main street quite charming. The Old Pickens County Jail built in 1906 is a popular attraction for tourist. The preservation of Jasper's historical district is to the credit of the Marble Valley Historical Society. Today a new burst of artistic life has come to Jasper in the expression of a large sculpture displaying a big white bear with children reading from the Old Testament. The sculpture was chiseled from white marble by artist Bill Sunderland and is located on the grounds in front of the county courthouse. The modest city park across from the courthouse has a creative theme of rock and water representing the precious watershed that washes down from the town's mountainous backdrop. The main street in downtown Jasper is a great place to take a leisurely stroll, with unique shops, restaurants and offices lining its historic district. For recreation Pickens County has numerous notable opportunities for visitors. You can fly fish the many swift flowing streams and creeks fed by the briskmountain waters of the upper Blue Ridge Mountains. If boating, swimming or bass fishing is your favorite past time, Carter's Lake bordering along the northwestern edge of the county is a beautiful example of one of North Georgia's more recently constructed lakes. Carter's Lake was created to capture the mountain fresh waters, operating as both a reservoir and a recreation lake. Most of the lakes in the southern Blue Ridge Mountains were created in the 1930's and 40's, for the dual purpose of flood control and hydroelectric generation. Carter's Lake was built at a even later date, due to the growing population in northern Georgia and the Atlanta metropolitan area, water reserves are very important. When visiting the earthen dam park area, you'll find a plaque marking the general vicinity where Hernando DeSoto and his expedition of 600 men and horses visited this area in the 1500's during their quest for gold. Local Native Americans of the 1500's had little interest in gold other than for use in decorative jewelry and some trade. Most of the local Native Americans directed DeSoto to other locations just to get rid of the invaders. DeSoto and his men often persecuted the tribes and in some cases tortured them, seeking the location of gold deposits. Little to no gold was discovered by the Conquistadors in their search through the southeastern United States. What DeSoto and his men did accomplish was the spread of disease to a people who had little immunity to these European diseases. It took nearly 300 more years before gold was discovered in abundance in North Georgia, this discovery led to the removal of the Cherokee People from the region on the infamous Trail of Tears. 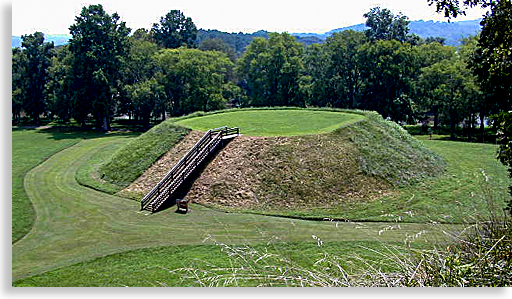 Located near Pickens County just outside Cartersville you'll find the earthen mound city of the Etowah people located on the banks of the Etowah River. This city of sophisticated people had an estimated population on 25,000 inhabitants; their disappearance as a society could have likely been caused by a devastating plague brought about by DeSoto's expedition. Three of the cities mounds, plaza area, along with a museum display the life and customs of the Etowahian People. The largest of the three mounds, the Chieftains Mound is several stories tall; the ancient city is a very interesting sight to witness whether you're an ancient American history buff or just a novice sightseer. Hiking, horseback riding, mountain biking, camping, picnics and canoing are available in Pickens County plus there are several small lakes dotting the countryside. Talking Rock Creek is a picturesque mountain stream cut deeply into the canyon foothills near the southern Cohutta Mountain Wilderness with primitive mountain scenery and high cliffs, great for canoeist with Class I-III rapids. You can take a trip up to Mount Oglethorpe, a modest mountain of 3,290 feet. There's a monument on the mountain to Mr. Oglethorpe, the founder of one of Georgia's oldest cities, Savannah. The mountain over looks the lowlands of Upper Georgia; at night you can see the city lights of Atlanta on the southern horizon. 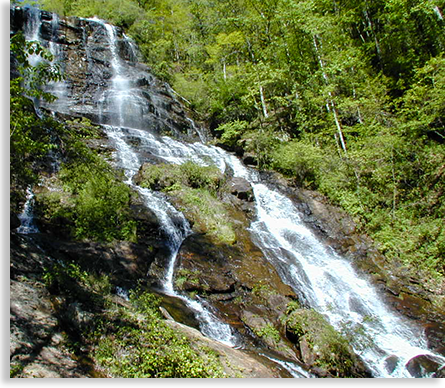 Located near northeastern Pickens County is Amicalola Falls State Park. The word Amicalola means “tumbling waters,” in the Cherokee language. The falls are so high they can be seen from highway 52, as you approach the park from the south. The 729-foot waterfall is actually created by seven cascades from Amicalola Creek; the waters pour over a steep cliff in a straight line high above the park entrance. It is the highest waterfall in Georgia. Above the falls you can pick up a trail that leads several miles up Springer Mountain, the trail will take you to the far southern access of the Appalachian Trail. The Appalachian Trail begins in north Georgia and ends in Maine traversing mountain ridges and valleys on its journey north. 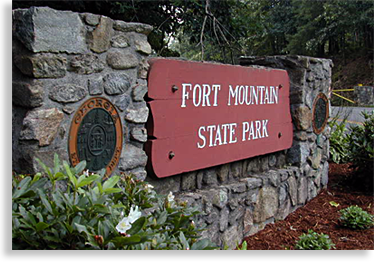 Another interesting location just north of Pickens County is Fort Mountain State Park. An enigma lies at the heart of this mountain top state park, it is a stonewall of unknown origins created by ancient Native Americans, estimated creation 500 A.D. The wall has a mysterious legend about its creation though no one knows any more about it now than they did during its possible discovery when DeSoto and his expedition arrived in the 1500's. Even the Cherokee know very little about the 855-foot long wall. There are plaques near the wall with some unfounded information mostly legends and fables, visit the wall and see if you can unfold its secret origin. Fort Mountain has many hiking, horseback, and mountain biking trails plus a 400-foot cascading waterfall and an abandon gold mine along with many other unique features. Pickens County is a beautiful destination at the mouth of the southern Blue Ridge Mountains with many opportunities awaiting all visitors including shopping, dining and lodging. The towns, farmlands, orchards and countryside offer a homegrown hospitality all cast against a mountain backdrop of sapphire blue ridges. Pickens County, a land rich in history and progress.